Instead of using terms such as Millennials, Generation X, Z or Y and dividing groups of people in 30-years periods, we are going to take a different approach and divide groups of people, born in different decades, since we believe people’s values change more rapidly. We will concentrate on the age factor, but will try to regard the rest of the factors as well. For example, USA’s generation born in the 1980s would differ rather drastically from the people born in the same decade in a socialist country, such as Bulgaria. Last but not least, many people would prefer to build their expectations on the ground of what they think is possible and likely to be offered as job benefits, rather than what they actually desire. For those born in 1960s the adult, job-bound life became reality in the 1980s, but the values of their parents and society inevitably translated to them and eventually created their ethics, values, desires and expectations. official and professional working environment. Actually, this is the generation which would have a more cynic point of view and would be less dedicated to the employer and more likely to change their job if better working conditions and benefits are offered. Those born in the 1990s already should have more than a few years professional experience and be on a professional track. 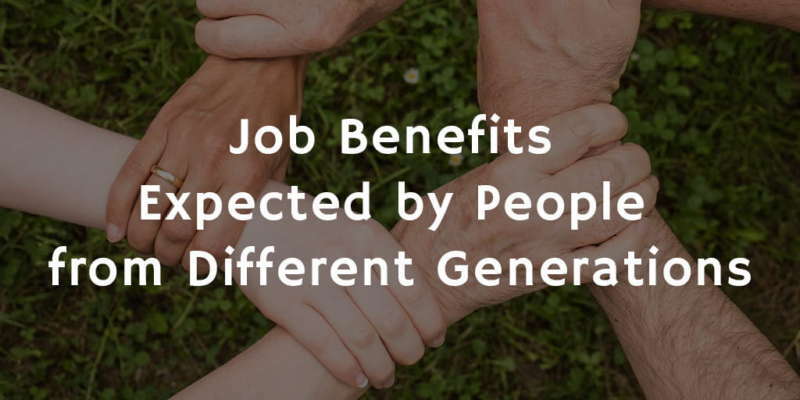 Perhaps because they are expected to cover a wide range of skills, they also expect a big variety of benefits back. health programs at work and more. Some would still prefer a working environment and colleagues sharing their interests and even hobbies. Many companies owned by people born in the 1990s would stick to a particular style and would employ people who are at least somewhat alike. These young people born in the 2000s are at the start of their careers and may have somewhat unrealistic expectations due to their lack of work experience. Perhaps some think that right after they graduate they will land their dream job, will be adequately paid and respected. Those are people who hardly stick to one job for a long period of time and aren’t afraid to resign and be in the search for another job indefinitely, possibly, because they can afford some financial and professional insecurity. These are children pushed to be tech-savvy, to speak a bunch of languages, to be sport-oriented and pretty much to be a new-wave Renaissance people. Possibly in return for their often taken childhood these people would expect smart homes and robot assistance. Or otherwise said, this generation would expect adequate payment – not just enough amount to survive but a payment actually worth their time and efforts.